We define HTML as an embedded domain specific language in Haskell. To this end, we have designed and implemented a combinator library which provides the means to create and modify HTML elements. Haskell’s type classes are employed to enforce well-formed HTML to a large degree. 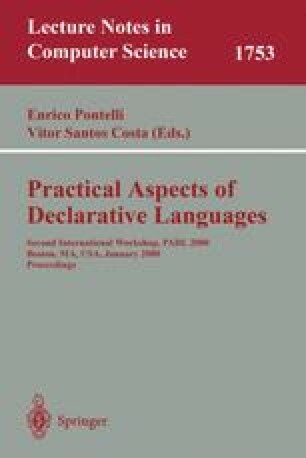 Haskell can then be used as a meta language to map structured documents to HTML, to define conditional content, to extract information from the documents, or to define entire web sites. We introduce container-passing style as a programming convention for the library. We also pinpoint some shortcomings of Haskell’s type system that make the task of this library’s implementor tedious. Tim Bray, Jean Paoli, and C.M. Sperberg-MacQueen. Extensible markup language (xml) 1.0 (w3c recommendation). http://www.w3.org/TR/REC-xml, feb 1998. Daniel Cabeza and Manuel Hermenegildo. Www programming using computational logic systems (and the PiLLoW/CIAO library). http://www.clip.dia.fi.upm.es/Software/pillow/pillow/_www6/pillow/_www6.h%tml, March 1997. Ralf S. Engelschall. Website meta language (wml). http://www.engelschall.com/sw/wml/. Haskell98, a non-strict, purely functional language. http://www.haskell.org, December 1998. SoftQuad Software Inc. HoTMetaL. http://www.softquad.com/. Mark P. Jones. Hugs Online — embracing functional programming. http://www. haskell.org/hugs/, June 1999. PC Magazine. Web authoring tools. http://www.zdnet.com/pcmag/features/htmlauthor//_open.htm, January 20 1998. Internet Software Technologies. HTMLed Pro32. http://www.ist.ca.